$26 - Lightweight and perfect for those cool summer nights, this tween jacket is a new arrival from trendy PPLA. The design is created with a unique woven fabric that is rayon and creates a light layer. The red is covered with a fun paisley bandanna print. Knit trim is found on her neckline, hem and the cuffs of her long sleeves. A zipper closes the front with ease. 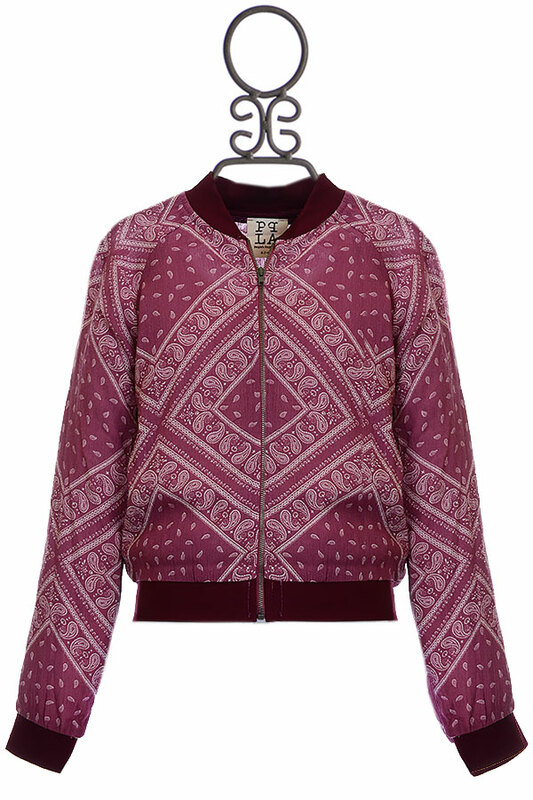 The bomber cut is perfect to pair with many of her summer tops. 100% Rayon Shell. 65% Rayon, 30% Nylon, and 5% Spandex trim. Hand Wash Cold, Lay Flat to Dry. Made in the U.S.A. SIZE SM 7/8 AVAILABLE.